Make sure you record both the site and secret key somewhere safe - we'll be using them, later. Plugging in the site and secret keys, and telling Dada Mail to use Google reCAPTCHA is done in Dada Mail's global configuration. The easiest way to work with that is through Dada Mail's included web-based installer, so an install or upgrade would be the perfect time to set all this up. Once in the installer's configure screen, look for Advanced Options. 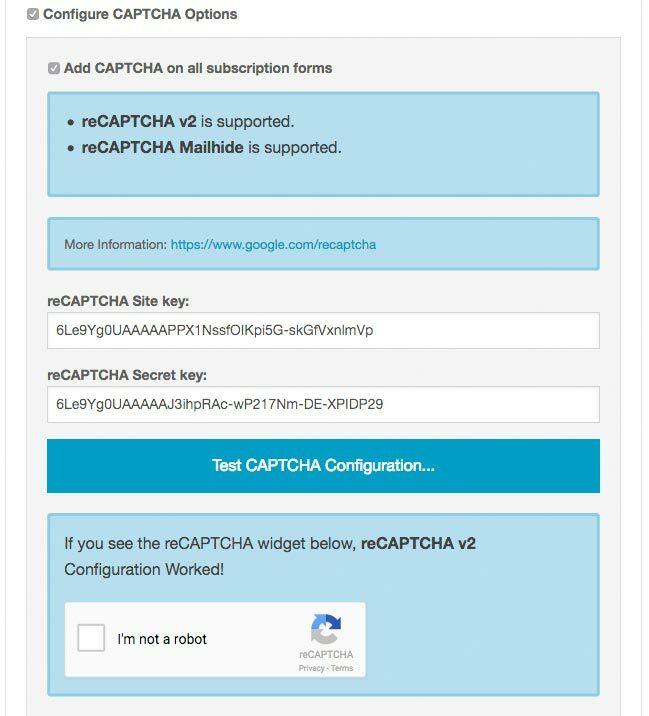 Dada Mail supports displaying and verifying a CAPTCHA on the initial subscripion form. Check the box labeled, Add CAPTCHA on all subscription forms to enable this feature. CAPTCHA protection in the "Forward to a Friend" Form is highly suggested, as this form is easy to spoof. In the list control panel, navigate to: Archives - Options. CAPTCHA protection is available for Dada Mail Profile Registrations. If you're using the reCAPTCHA service, you may also take advantage of reCAPTCHA Mailhide. In Dada Mail, this is used to protect individual email addresses in mailing list archives. Before an email address can be viewed, a CAPTCHA has to be solved. Mailhide can also be configued in the Dada Mail Installer. If not already shown, click the button, Show/Hide Advanced Options..., then check the option, Configure CAPTCHA Options. Additional CAPTCHA settings will then be revealed. In your list control panel, go to: Manage Archives - Advanced Archive Options, under, Email Address Protection select, reCAPTCHA MailHide. You may need to separately install the Captcha::reCAPTCHA::Mailhide CPAN Perl module, in order to gain reCAPTCHA Mailhide support.